Ricta Scorpions feature NRG Hi-Energy urethane formula, the fastest non-core wheels, pro tested and proven. 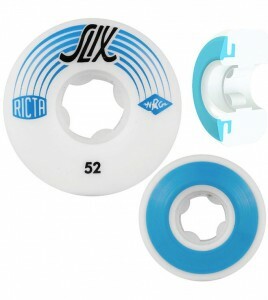 Ricta Slix: Grind Faster – Grind Longer! The revolution in skateboard wheel technology continues… Ricta Slix combine our NRG Formula, proven THE fastest urethane in skateboarding, with a custom molded TPU slide insert for three times more slip and minimal drag on the inside of the wheel for longer and faster grinds. 81b is hard and fast!